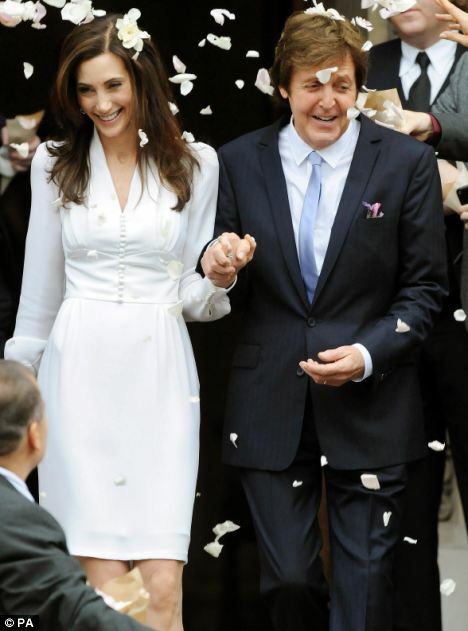 Two members of the local council were called to the former Beatles legend's north London mansion on Sunday evening as he celebrated his nuptials with new wife Nancy Shevell and around 100 guests following the ceremony at Marylebone Register Office earlier in the day. A source told The Sun newspaper: "It did raise a laugh when the two gentlemen rang the door bell and insisted it was time to settle things down. It could have been 1968 all over again." DJ Mark Ronson was in charge of the disco at the star-studded event - which was attended by Kate Moss and husband Jamie Hince, as well as Ronnie Wood, David Gilmour and Jeff Beck – and he played a number of Beatles classics and some of The Rolling Stones' greatest hits as the party went on until 3am. Andrew Ralph, head of noise and licensing at Westminster Council, confirmed the council workers visited a house in the area to ask for the noise to be toned down following a complaint. He said: "A complaint was received about an address in St John's Wood. Officers visited and the volume was reduced. No further action is being taken." Paul's son James took on the Best Man duties at the reception and paid tribute to his father, who was marrying for the third time. He explained: "Dad and I have been great friends ever since he first asked me to join The Beatles." During the wedding ceremony the 51-year-old heiress wore a long-sleeved dress in Ivory silk - which was designed by Paul's fashion designer daughter Stella McCartney – and was presented with a Neil Lane eternity diamond ring featuring five carats of square-cut diamonds set in platinum by Paul. The celebrity jeweller explained the band was created to “complement" her engagement ring – a five-plus-carat, flawless diamond art-deco ring which he also designed - "but not overshadow it". He added to People.com: "Nancy wanted a band with a vintage feel.